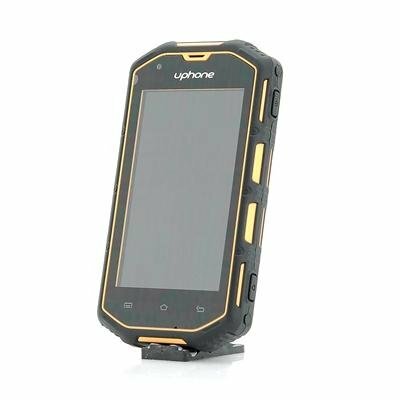 Successfully Added Uphone U5A Rugged Dual Core Phone - Android 4.2 OS, IP68 Waterproof + Dust Proof Rating, Shockproof (Yellow) to your Shopping Cart. Here is a phone that can withstand a punch from Iron Mike Tyson, this is the Uphone U5A and it is ready to stand to attention. Working in the wet environments? Dirt becoming a problem with your existing phone but you still need all the functions that a modern smartphone offers? The answer is here and it is clear, the Uphone U5A. Making this phone seem almost invincible to the elements is its rough rubber exterior that rewards it with the rugged title. It can get wet and it can roll around in the dirt as it has an IP68 rating making it ideal if you work out in extreme conditions. Located inside this masculine rugged phone is a dual core processor that makes certain that this phone operates efficiently. Control as everything happens and have the phone set up the way you want with an Android framework and enjoy your time getting to experience the most popular and advance operating systems to date. Use the Wi-Fi or 3G to access the internet and browse your favorite websites as well as further customizing your phone with apps from the online Google Play store. Other features include dual SIM card support for managing two separate numbers simultaneously, Bluetooth, FM radio and the ability to be used as a portable Wi-Fi hotspot. 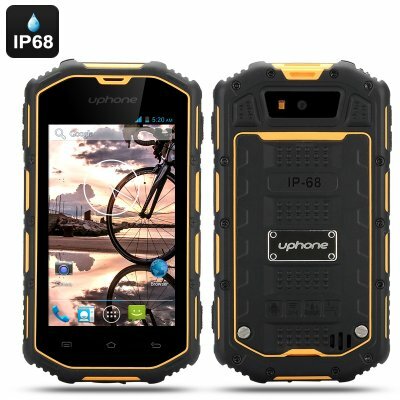 Don’t become a victim to the harsh climate and order this rugged smartphone today.